All have been tested and are free of any white dots. Manufacturer's Part Number V12H523001. Device Type Digital pen. Connectivity Technology Wireless. Standard lens pulled from a new projector that required long throw lens. Lens is in perfect condition. The 1076-6039B was flawed an had a problem with overheating. The pulled them early and replaced with a temporary fix the 6139B. They worked to fix this design for more than a year and there was no 6239B release. With its simple flush mounting design, the Optoma OCM818W-RU Projector Ceiling Mount can be disconnected and reconnected rapidly. It also makes projector maintenance a lot easier, and can support loads of up to 15 kg. DMD chip should be replaced by certified service, projector cooling system should be repaired before installation. Item Genuine DMD DLP chip pulled from projector, hours of usage are unknown. Dead pixels appear because of an overheating of a chip. BenQ MS531, MX532, MW533, MH534, MX604, MW605, MH606, TH534, TW533. JG706.001 / RCX013. Product Details Product Code: PRO-DMD-001. Lunedì - Venerdì 09.00 - 17.30 orario continuato. Orari di lavoro P.iva: 05294791008. Via Casale Romani, 1 Lariano (Roma). newcam srl. VENDITORE PROFESSIONALE . PRIVACY . CONTROVERSIE . Up for sale: NEC NP09ZL long throw projector zoom lens. This lens is compatible with many models of NEC projectors. Here is my ultra short throw projector mount that I've been using with the Optima GT5000 . Heavy duty and excellent quality. It cost me £150 new and has cable management channels in the arm. Sadly I've decided to strip out my home cinema so it must go. It doesn't come with any bolts for fixing but you can use any regular fittings you have. With its simple flush mounting design, the Optoma OCM818B-RU Projector Ceiling Mount can be disconnected and reconnected rapidly. It also makes projector maintenance a lot easier, and can support loads of up to 15 kg. Product Overview The OCM815B Black Universal Projector Pole Mount is ideal for high ceilings. It’s the perfect universal projector pole mountFeatures • Easy to install – Great flexibility and adaptability. Cleverly designed for the Dell S320 and S320wi, this interactive Standalone pen sports a sleek design and functions as a mouse, a drawing tool, or a writing assistant at your command.Use this pen in concert with the Dell S320 and S320wi and its interactive Standalone projection software and enjoy both on- and off-surface (up to 9m) interactivity. Accommodates virtually every size of projector. DMD chip should be replaced by certified service, projector cooling system should be repaired before installation. Genuine DMD DLP chip carefully pulled from fully working unit. Dead pixels appear because of an overheating of a chip. Opened the box to take the picture. CHIP TESTED WORKING WITH NO DEAD PIXELS. Serial 33Z64TA 170507E. We don't know why the number on this lens is 220, not 221. It works with the following models: iQ G200L, iQ G210L, iQ G300, iQ G350, iQ G400, iQ G500, iQ Praxis G300, iQ Pro G200L, iQ Pro G210L, iQ Pro G300, iQ Pro G350, iQ Pro G400, iQ Pro G500, iQ Pro R200L, iQ Pro R210L, iQ Pro R300, iQ Pro R350, iQ Pro R400, iQ Pro R500, iQ R200L, iQ R210L, iQ R300, iQ R350, iQ R400, iQ R500. This is pulled from working projector and present perfect and clear image without any dots. New; In Good Condition Minolta Projector Lens 4093324-0003/20000107MN Looks to be for a projector but we are not sure of any specific model. Glass is in good condition with cover caps, no scratches or scuffs. This item is best described as it is pictured. . 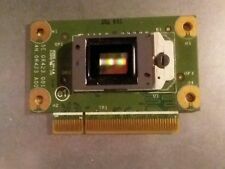 This is the latest version of this type of DMD chip.This DMD chip is used in XGA projectors with a 4:3 aspect ratio and 1076 x 768 native resolution. I have other projector parts available too. NP3250 Product Condition NEC Manufacturer NEC Item Condition Weight (lbs): 6.00. This item has been Tested for Key Functions, Ready for Resale. Untested, Missing Parts or Complete System Required For Testing Accessories. Projection distance ration (projection distance / projection screen width). Zoom ratio 1 to 1.8. F number 1.65 to 2.55. This product is compatible with Dell M110/ M115HD Projectors Only. Dell Part# 71X6X, 331-6749. DELL 331-6749 Original 24-Pin to VGA Cable for Dell Ultra Portable Projectors. Allows Connection in following: USB A to USB A cable, HDMI cable, 3.5 A/V mini-jack male to 3.5 A/V mini-jack male, 3.5 A/V mini-jack male to RCA left/right/video, 24-pin male to VGA with 3.5 audio out. Hitachi part numbers GP00911, GP00912, GP00913. Motor Mirror Assy A1. EAN/UPC: 5711783471387, 840JS77680. The gear is made from an better / stronger material. SLS Nylon with internal stainless steel pins. 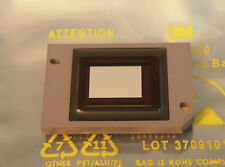 Projector DMD Chip 8060-6038B TESTED OK REF HP3. TESTED OK NO DEAD PIXELS. Compatibility: NEC Projectors Lamp Life: 3000 Hour. Lamp Power: 225 W. Prod 65 Warning required. Limited Warranty: 6 Month. Country of Origin: Taiwan. Sale includes the Mimio Teach Bar ONLY. No stylus included. Software can be downloaded online. Unit is in good condition with light signs of use. Perfect working order. The concept is to use highly complex multilayer thin films to divide the visible spectrum into two distinct white light sources. This "White" is then colored, and projected from two displaced perspectives, onto a remote screen. Avec les haut-parleurs et support intégrés, les périphériques sont réduits au minimum. livré avec cable micro-hdmi vers Hdmi acheter en plus pour exploiter ce videoprojecteur. Cable ordinateur (VGA). Manufacturer: Optoma Technology. Optoma Projectors:DH1010. It's the perfect universal projector flush mount. Easy to install - Great flexibility and adaptability. Quick projector reconnect/ disconnect. KRAMER HAMA VP12XL VGA XGA Verteiler Distributor 1:12 19"
Bandwidth exceeding 300MHz ensures that the VP-12xl remains transparent even at high-resolution VGA modes. - voll funktionsfähig. This DMD is for WXGA (1280 x 800) resolution projectors. I have other projector parts available too. SUPPLIED WITH DMD PCB PWB-L030-B-2. CHIP HAS NO DEAD PIXELS AND IS WORKING OK. This board appears to be factory modified. Not sure of the reason. I decided it wasn't worth the effort. I did place it in my projector 808/808s hybrid and it worked fine. I don't know if this board is only compatible with certain models or matching cards.